HPC Cash Drawers are constructed of a heavy welded 18 Gauge metal housing from KRUPP Metals, and the drawers are machine formed with exactness and computer precision. Unlike other mass produced cash drawers, our process ensures exact centerline movement of the drawer. Our passion to produce the worlds best cash drawer has driven us to design a drawer that eliminates side loading, thus reducing wear and extends the life of your cash drawer. Our Engineers have designed a simple but reliable latching mechanism. This revolutionary latch assembly requires less force to open the cash drawer. This feature now makes it possible for receipt printers to reduce the amount of current, used to open the drawer, eliminating the possibility of over loading which can damage your Receipt Printers' Power Supply. 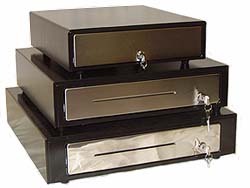 Our entire line of cash drawers come with a 3-position lock. (Closed, Open and Manual release) If you ever misplace the keys or lock the keys in your cash drawer by accident don't worry. All our cash drawers come with an Emergency Drawer Release Lever, located under your cash drawer. Heavy Duty ABS plastic money tray, with removable coin tray (5 or 9 coin) and adjustable 5 bills compartment, allows you to accommodate US Currency as well as Europe/Canada/Latin America Currencies. Unlike the other cash drawer companies, we use a special "3-Layer" oven baked textured finish on all our cash drawers, which are available in black, ivory, or custom color finishes. The durable stainless steel front panel not only accents our cash drawers beauty but also reflects our commitment to excellence. Our In-House Design and Construction facility allows us to accommodate any OEM requirements and offers you the ability to Private Label our cash drawer under your company name for that special POS project.